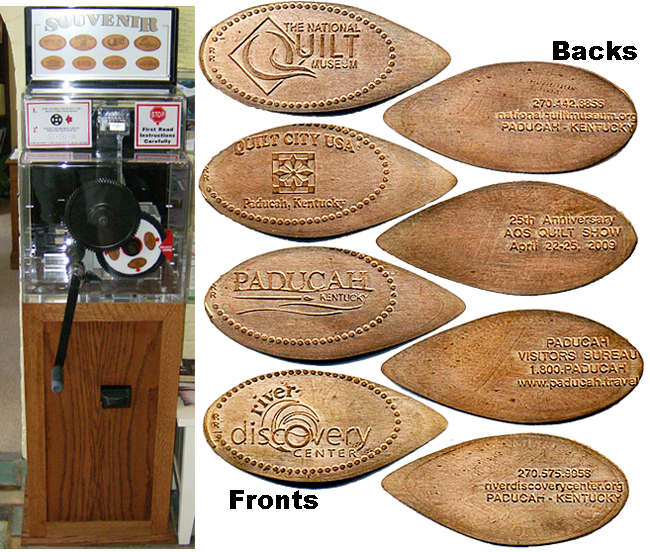 This machine was formerly located at the Paducah-McCracken County Visitor Center. The Visitor Center donated the machine to the River Discovery Center because the Center is open seven days a week from 9:30 to 5:00 and gets a lot more traffic, especially kids. The Center s Executive Director wants to replace the four designs with four that reflect the theme of the River Discovery Center.Hand cranked, 4 designs, horizontal on both sides, 50c + 1 penny. The reverse of each lists information pertaining to the subject of the front. Free parking across the street. Machine is in gift shop before museum. Did not have to pay admission to get pennies.